This completely new Spyro adventure, featuring gameplay focused heavily on dynamic action and fast-paced combat, uncovers the true origin of Spyro the Dragon as he evolves into a living, breathing weapon of explosive destruction. This epic story of Spyro's quest to discover his roots and realize his destiny is brought to life by leading Hollywood voice-over cast members Elijah Wood as the new voice of Spyro; David Spade as Spyro’s sidekick Sparx the dragonfly; and Gary Oldman as Ignitus, the Fire Dragon Elder and Spyro's mentor. 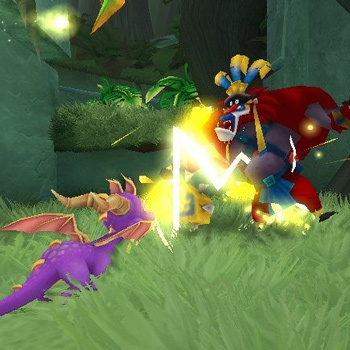 In The Legend of Spyro A New Beginning, players will experience the awesome power of the purple dragon as they unleash devastating fury attacks, upgradeable breaths and ground-to-aerial melee combos in frenzied battles with hordes of menacing enemies and bone-chilling bosses. The action game also introduces a new dragon upgrade system, giving players the freedom to increase the power and variety of attacks to their liking.